The Altair Diamondtome DM5000A is a medical grade skin resurfacing system that can help rejuvenate your skin without the use of crystals. Developed by Altair Instruments, the same company responsible for the NewApeel and HydroWand, this equipment was introduced in 2001 with great success in the medical field.Only available for purchase by medical professionals, this unique system allows doctors to treat a wider variety of skin concerns all over the body. When Sunray Laser Equipment refurbishes laser equipment, we do not cut corners or allow the performance of the product to decline. Each refurbished item we have in our inventory is thoroughly inspected and tested so we can assure you that your product will be just as reliable as the day it was made. 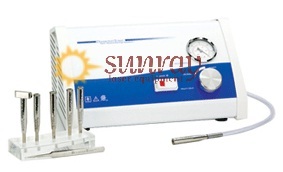 SunrayLaser.Com offers some of the most reliable and honest customer service in the industry. We always provide our customers with up-front and honest price quotes. Do not hesitate to contact us to get a quote on the Altair Diamondtome DM5000A today!